When moved to our current home and five acre block nearly 30 years ago. Over that time I have recorded over a hundred different species that have visited or flown over. About 40 of those are resident – meaning they can be seen most days – and most of those have been recorded breeding here. 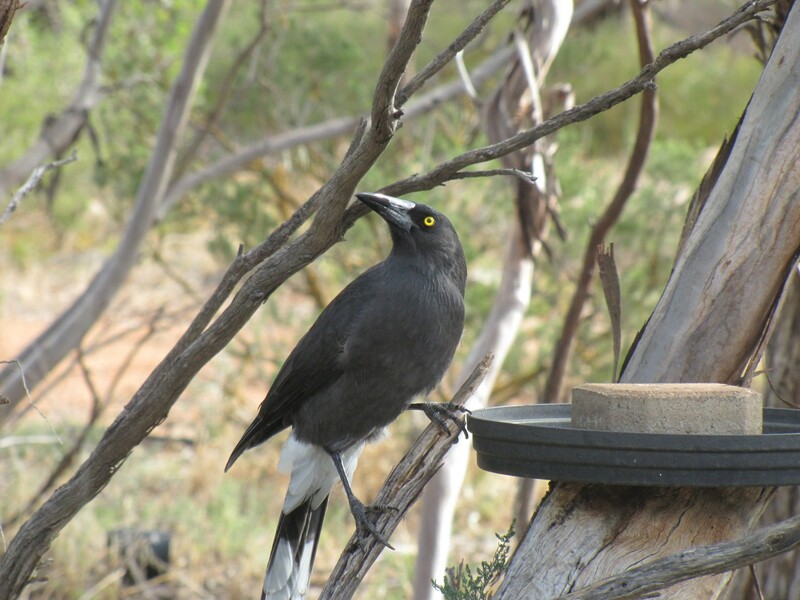 The locally common Grey Currawong was a notable species absent from my lists for several decades. We would occasionally hear one calling in the distance up the hill about a kilometre away. This is an area of thick mallee scrub. They rarely ventured down into our garden. That all changed about ten years ago. Now this species is a frequent visitor in our garden and we see or hear one or more every few days. I still wouldn’t call it a resident species, though. On a few occasions a local breeding pair have brought their recently fledged off-spring to visit too. Even rarer is a visit to one of our bird baths, but this, too, is changing. Last week I managed a few good photos of one bird as it was drinking. 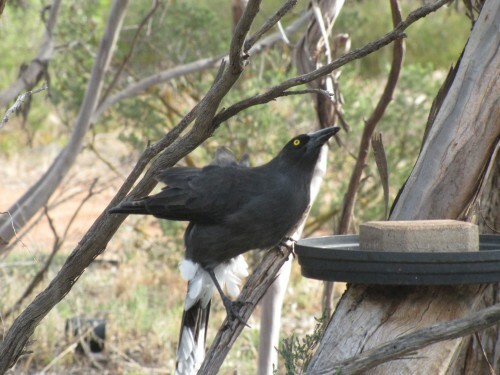 Those bright yellow eyes are quite penetrating, and I am not surprised that smaller birds – like the thornbills and honeyeaters – get very nervous when the currawongs are around, sending out warning calls. That large beak would easily gobble down a nestling by the look of it. We are currently experiencing another heatwave. Tomorrow is forecast to be the 11th consecutive day over 30C; some of the days – like today – the temperature has reached 40C (104F). During such days I add a bucket of fresh rainwater to the various birdbaths we have in our garden. Several of them are in clear view of where we often sit to eat, or to enjoy some reading. Sometimes I even do my writing there; it gives me a break from my office and I have a different view. The camera is usually ready for action, so on occasions I neglect my writing and attend to some serious bird photography. During the current heatwave the birds have been coming daily to drink, bathe and generally have a good time. The parade of species is impressive. We sometimes have up to a dozen different species come to drink in a 10 or 15 minute period. 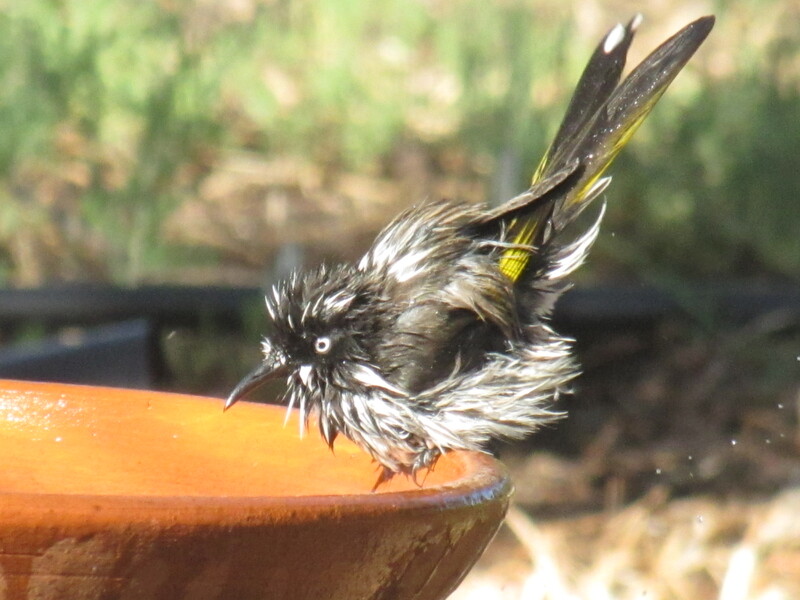 Last week I captured a series of photos of about a dozen New Holland Honeyeaters having a great time cooling off in the water. Droplets fly in all directions and some are left looking absolutely drenched. For more photos like this one click here. Earlier this week it was rather warm. 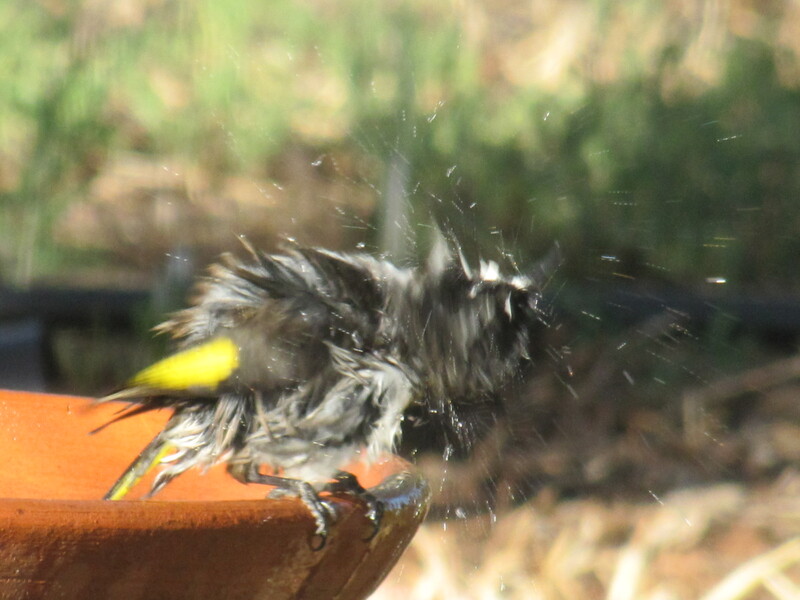 On most days we have some birds come to either have a bath, or have a drink. Many do both. Some just sit in the water, especially on very hot days. 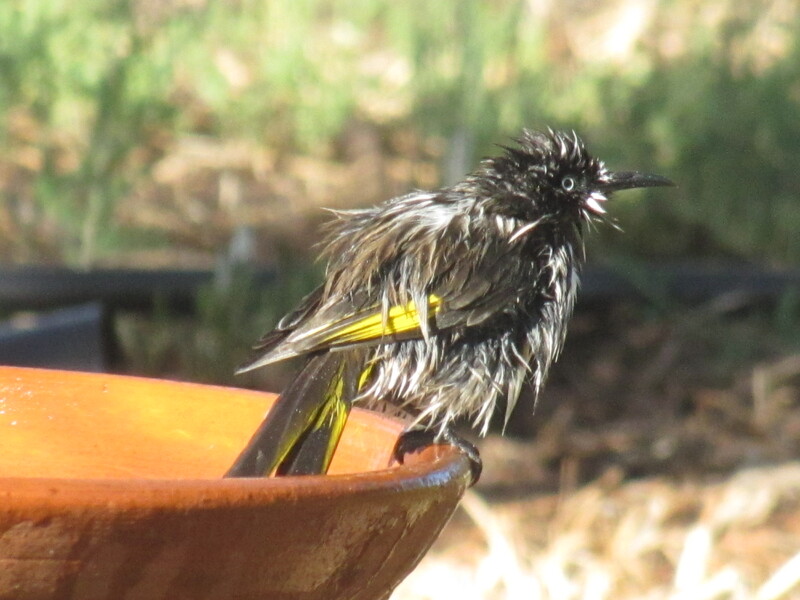 The New Holland Honeyeaters caused the greatest kerfuffle; water went absolutely everywhere. I managed to capture this series of photos of one individual getting totally soaked. Now I’ll have to get a bucket of rainwater and refill the bird bath. Some of the photos shown here on Trevor’s Birding can now be purchased on tee shirts, coffee mugs, stationary and a large range of other items. Go to Trevor’s Photos site here. On our current trip to Sydney to visit family, we stopped a few times along the way. As I said yesterday, the journey is over 1300km, so we need to stop a few times for fuel and to change drivers. We also stop occasionally for a cup of tea and a meal break. On these occasions we usually choose a place well away from towns and in a bush setting; the birding is often better. On the second morning of our trip we stopped at an unnamed rest area on the side of the Sturt Highway between Hay and Narrandera, NSW, in the locality of Tubbo Station. While having morning tea and a cuppa I saw a number of bird species, including Australian Ravens, Australian Magpies, Willie Wagtails, Black-faced Cuckoo-shrikes, Grey Shrike Thrush, White-winged Choughs and the tiny Weebill. All lovely birds but very common in this area, and all birds I’d seen many times while driving along. We also saw several Yellow Rosellas, a beautiful bird and less widespread than many parrots. Another interesting bird is the Apostlebird, one I always enjoy seeing on the journey over to Sydney. Undoubtedly the highlight of this brief stop was to see several Noisy Friarbirds, one of the honeyeaters of Australia. While this is a common species in the eastern parts of Australia, it’s not one I’ve seen very often, making it an extra special sighting. I didn’t get a photo of it, but you can read more about this species and see a photo here.